The STADCO Precision quality system is ISO 9001:2015 certified. This means a high level of control over all aspects of our precision machine shop manufacturing process, from the time raw material enters our dock, until shipment of your machined parts to your facility. Your shipment is traceable from raw material heat lot to machine work center and operator. 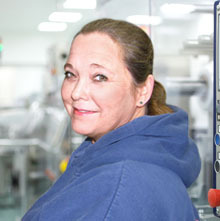 Our quality assurance department works with our customer to develop quality plans and detailed job instructions to ensure the parts meet or exceed their required tolerance level. Incoming material inspections, machine set-up validations, operator in-process inspections, final pre-shipment inspections, and gage calibration are all components integral to our quality system. All machine operators are trained in SPC as well as the use and care of inspection tools and gages. 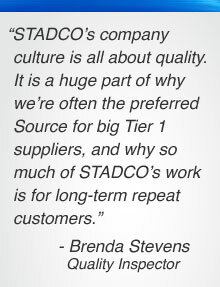 STADCO medical machining processes are also performed to the highest standards.